Usually, when a player is feeling under the weather, said player isn’t expected to come up big with a career performance. 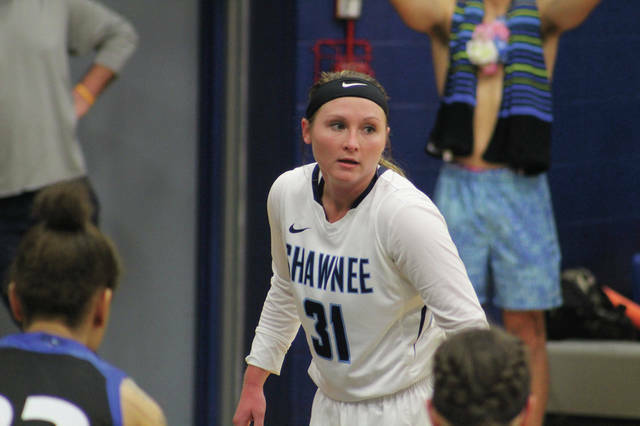 However, Shania Massie not only gutted out the flu, but put together arguably the best performance of her career through her two seasons in a Shawnee State women’s basketball uniform on Saturday afternoon against Georgetown (Ky.). The junior guard, who is more well-known for her hustle and scrappiness as a vital role cog to the Bears’ effective bench, added a strong scoring punch of her own as Massie knocked down seven of her 12 shot attempts — including a strong 4-of-8 mark from behind the line — as Shawnee State rolled to an 87-52 victory over Georgetown, clinched a share of the Mid-South Conference’s regular season title, and sewed up the No. 1 seed in the Mid-South Conference Tournament all in one fell swoop in a special Senior Day at Frank and Janis Waller Gymnasium. From the outside, Shawnee State was simply feeling it from behind the line as the Bears — who knocked down 14 three-pointers in the contest — canned six of those treys in the opening quarter alone. Massie, Madison Ridout, and Hannah Miller each drained a pair of treys as the Bears ultimately finished the frame on a 16-8 run en route to a 24-13 first-quarter lead. Shawnee State, however, was just beginning to get the ball rolling from behind the line. After nailing six first-quarter treys, the Bears added seven more makes from deep to completely put the game out of reach as Shawnee State’s 13-of-24 mark from deep in the first half of play, along with a stellar two-to-one assist-to-turnover ratio (20 assists to just 10 turnovers for the game) allowed Shawnee State to develop a 57-29 halftime advantage. A 21-2 run during the second quarter allowed the Bears to turn a nine-point lead into the 28-point margin as Ashton Lovely knocked down all three of her treys during the spurt while Massie added her two remaining three-pointers in the same run to put the game out of reach. Shawnee State, however, only continued to step up its game. In the second half of action, the Bears held Georgetown to just 21 percent shooting as the Tigers only obtained 23 points off of 28 field goal attempts, combined to 29 off of 25 in the first half. However, it wouldn’t be a full contest without including the two seniors from Jackson. Ridout and Lydia Poe, who each played their final games as Frank and Janis Waller Gymnasium, each showed the crowd why they will be remembered for a long time to come as Ridout put together 18 points on 7-of-14 shooting, nine rebounds, and six assists to just one turnover while Poe — who started but only played seven minutes as the coaching staff decided to rest Poe up for the looming postseason play that is coming up — grabbed four rebounds, scored on a bucket inside, and got to the free throw line twice in making every minute count. In addition to Massie and Ridout, Miller and Lovely also finished in double-figures with 15 and 12 points, respectively while posting three-to-one and two-to-one assist-to-turnover ratios. Bailey Cummins added six points while the freshmen quartet of Leah Wingeier, Hagen Schaefer, Laken Smith, and Sienna King scored four, three, three, and two points, respectively, to put all 10 players in the scoring column. With the victory, Shawnee State improved to 25-3 overall and 12-0 in the Mid-South. However, to win the conference outright — which the Bears can do with just one victory over either Cumberlands (Ky.) or Life (Ga.) on the road — they’ll have to face a Patriots squad that played No. 9-ranked Lindsey Wilson (Ky.) to a 62-54 margin and Cumberland (Tenn.) to a 51-46 margin. Shawnee State takes on Cumberlands on Thursday while the Running Eagles, who are 10-17 overall and 1-11 in Mid-South action, follow on Saturday.